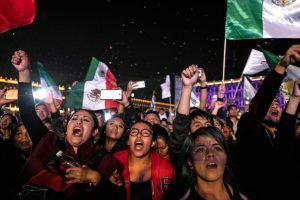 06/30/2018 (written by Lucy Clement La Rosa)- On July 1, 2018, in one of the most unprecedented elections of its history, Mexico elected a new President. Andres Manuel Lopez Obrador, commonly known by his initials, AMLO, will be Mexico’s next President. Previously having run for president in 2006 and 2012, his victory, though groundbreaking, is not surprising. AMLO consistently led election polls in comparison to the other major party candidates, Ricardo Anaya and Jose Antonio Meade. It goes without saying that 2018 will stand out in Mexico’s election history. For the first time ever, independent candidates were able to seek presidential nomination. In addition, aside from electing a new party candidate, Mexican citizens voted for over 18,000 elected positions. With 89 million eligible voters, the highest in Mexican history, election outcomes have the potential to markedly change Mexico’s political landscape. On that note, Lopez Obrador’s victory may significant influence on Mexico’s relationship with its northern neighbor, the United States. Even more so, however, Lopez Obrador’s proposed security agenda could have unique implications on Mexico’s current security. Born in Mexico’s state of Tabasco, Lopez Obrador went on to study political science and public administration at the National Autonomous University of Mexico (Universidad Autónoma de México, UNAM), Mexico’s largest public university. Lopez Obrador’s political experience is rooted in Mexico’s long standing political party, the Institutional Revolutionary Party (Partido Revolucionario Institucional, PRI). In 1976, he actively supported and campaigned on behalf of PRI Senate Candidate, Carlos Pellicer. Lopez Obrador left the party in 1988 to join the National Democratic Front (Frente Democrático Nacional, FDN), a dissident left-wing coalition assembled to challenge the hegemonic rule of the PRI. That same year, Lopez Obrador ran as opposition for Tabasco’s governorship. Although he lost, he ultimately became the president of the Party of the Democratic Revolution, a center-left party founded from the remnants of the FDN. Lopez Obrador served as PRD president from 1996 to 1999. Throughout his tenure, Lopez Obrador continued to build his political stature, including campaigning for indigenous rights, and organizing protests against Mexico’s behemoth energy company, Mexican Petroleum (Petróleos Mexicanos, PEMEX), and PRI corruption. In 2000, he was elected as Mexico City’s mayor. His time in office was considered to be generally successful as his administration significantly improved Mexico City’s infrastructure, including remodeling the historic metropolitan center, expanding highways and improving public transportation with the introduction of Metrobus, a public transit system. Ultimately, Lopez Obrador stepped away from the PRD and founded his own political party in 2014, the National Regeneration Movement (Movimiento de Regeneración Nacional, MORENA). In coalition with a left-wing Labor Party (Partido del Trabajo, PT), and right-wing Social Encounter Party (Partido Encuentro Social, PES), Lopez Obrador once again sought presidential candidacy in the 2018 elections. Under the slogan, “Together we will make history (Juntos Haremos Historia),” Lopez Obrador successfully led a center-left campaign that captured over 50% of the vote with one of the highest election margins in Mexican political history. His firebrand promises to bring change to Mexico, resonated with many Mexican voters. Lopez Obrador emphasized his determination to uproot corruption across Mexico and address rampant issues of poverty and violence. In particular, his rule of law and security-specific proposals include: creating a National School of Public Security to enforce a zero-tolerance policy on corruption among law enforcement, establish state-level entities and obligatory trainings to monitor and increase the professionalization of law enforcement officials across Mexico, target the socio-economic roots of organized crime to reduce the incentive of organized crime, reform the 19th Constitutional Article to allow for preemptive imprisonment for corruption crimes, and analyze the efficiency of the Judiciary Council and revise the structure of the federal judiciary, in particular the Supreme Court, accordingly. One of Lopez Obrador’s most controversial security proposals includes amnesty legislation for the purpose of reducing cyclical patterns of socio-economic insecurity in Mexico. Following his election, Lopez Obrador held his first security cabinet meeting to further develop the parameters of this proposed legislation. According to Alfonso Durazo- Lopez Obrador’s selection for Secretary of Public Security, a newly reinstated position of state- amnesty would be key to the new administration’s security agenda. Notwithstanding that amnesty is a politically ionized concept, particularly in Mexico’s current state of insecurity, some see it as a step towards the de-escalation of Mexico’s violence. Raúl Zepeda Gil, a security expert for the Institute Belisario Domínguez of the Senate of the Republic (Instituto Belisario Domínguez del Senado de la República), identifies three ways in which amnesty could introduce effective mechanisms for reducing violence, including: the perspective of post-conflict pacification, alternative sentencing for minor/non-violent acts, and revised drug regulations. Although, he concedes that implementing amnesty comes with another set of issues, such as sustainability and corruption, Zepeda highlights the benefits of amnesty negotiations and transitional justice strategies applied in Colombia, a country which experienced violence and organized crime similar to Mexico. Ultimately, he argues that amnesty legislation for Mexico may in fact be an effective formula to redressing systemic patterns of violence and socio-economic instability. 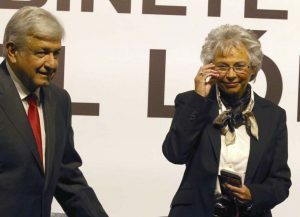 Andres Manuel Lopez Obrador and Olga Sánchez Cordero. (Marco Ugarte, Associated Press). These aforementioned and often controversial mechanisms are already under-consideration and open to public debate, according to Olga Sánchez Cordero, Lopez Obrador’s selection for Secretary of Government. In a recent Seminar on Violence and Peace: Forget, Truth, or Justice? (Seminario sobre Violencia y Paz: ¿Olvido, verdad o Justicia? ), she affirmed that the new administration will be open to transitional justice mechanisms in their bid to uphold a human rights-focused agenda. In the words of Sanchez Cordero, Mexico needs new institutions and new systems to amend its reality, including amnesty negotiations, but also alternative and reduced sentencings, the decriminalization of certain drugs, reparation polies, and socio-economic policies targeting the recovery of public spaces. Lopez Obrador’s intended approach has already elicited a response from the White House, in particular the topic of narcotic policies. In answer to the possibility that Mexico may legalize drugs, Sarah Sanders, the White House Press Secretary, asserted that the United States no way supports the legalization of drugs. However, Sanchez Cordero’s proposals have thus far only suggested the decriminalization of marijuana and opium. Upon accepting his appointment as President elect, Lopez Obrador stated that under his leadership he will “establish an authentic democracy” in Mexico. Political promises, apprehensive criticisms and hopeful constituents aside, only time will reveal the attainability of Lopez Obrador’s proposed security agenda. This entry was posted in Crime and Violence and tagged 2018 Mexican Presidential Elections, Alfonso Durazo, AMLO, amnesty, Andres Manuel López Obrador, Human Rights, Laura Chinchilla, MORENA, Olga Sanchez Cordero, PAN, PRI, Raul Zepeda Gil, Sarah Sanders, Security Agenda, socio-economic. Bookmark the permalink. Thanks a litros, is antes very reflexive article, we will see,i have hope that they security un México improve.